Hi there! I'm back today to share another card for my Pairing Up Challenge with Stephanie. 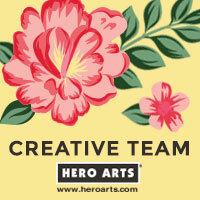 Today we are using the Hero Arts Dots and Flowers background and Essential Messages sentiment set. Love this, Kelly! Great colors and patterns and your stitching is perfect! Such a stunning card, you are so creative and inspiring, I love what you did with this card. LOVE this, Kelly - especially the scalloped text! So pretty, Kelly! Really terrific design! Love the flower and the leaves behind it. Great combination of color and everything. And I think it's so funny we keep using the same sentiment! Ha! so beautiful. love the pretty design and colors! Oh WOW!!! Another amazing card Kelly!! I am such a fan of your style!!!! Super cute card! Love the flower and the scallops! Wow!! Love all the colors on this, beautiful design!